1. The UK elections: In which Corbyn, the British Bernie Sanders, just won a plurality of seats in Parliament (though it's unclear whether he will be able to build a coalition). 2. The Comey Testimony: In which Comey outlined the case to charge Trump with obstruction of justice. Trump, however, was watching neither. Despite all of his threats to live-Tweet the testimony, Trump decided instead to deliver his speech to the Faith and Freedom Coalition. The legislation proposes a significant unwinding of the 2010 Dodd-Frank Act, one of President Barack Obama's signature achievements, which imposed new regulations across the financial system in the wake of the 2008 meltdown. Passage was a major victory for Hensarling, a fierce fiscal conservative who opposed the bank bailouts under the Bush administration and has led a crusade for years against Democrats' response to the crisis. Hensarling argues that the economy and consumers would benefit from his vision in which market forces rather than government regulation would keep the financial system in check. Among the bill's most controversial measures is the elimination of most of the powers of the Consumer Financial Protection Bureau, the independent regulatory agency that is Democrats' crown jewel in Dodd-Frank. Yes, he really did eliminate the CFPB and then said "consumers would benefit." Let's be frank, Republicans hate the CFPB because it costs their donors millions of dollars. They don't care about consumers. They don't care about throwing hundreds of billions of dollars to bail out Wall St. What they care about is keeping their donors happy. That's it. The changes to the CFPB are unlikely to get traction among Senate Democrats. Veterans of Foreign Wars, a group with about 1.7 million members, initially planned this week to rally opposition against the CHOICE Act because of the proposal. But Hensarling made a last-minute pledge to try to allay the group's concerns. The bill would also repeal a pillar of Dodd-Frank that allows regulators to manage the failure of a major financial institution, replacing that power with an updated version of the bankruptcy code. Recall that prior to Dodd-Frank, we had the 2007 Global Financial Crisis that literally bankrupted countries like Iceland and Cyprus and cost the US trillions of dollars in financial recovery bills because of the Housing Bubble. And before that we had a Wall St. crash in 2001 because of the Tech Bubble. And before that we had a crash in 1991 because of the Japanese Asset Bubble. Etc. 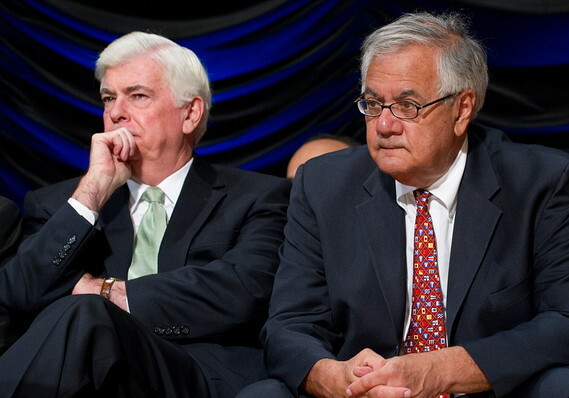 Dodd-Frank's purpose was to protect us when the next bubble burst. It wasn't perfect, but we haven't had a financial meltdown since Dodd-Frank -- and that's saying a lot. The unwinding of the CFPB and the bank failure backstop are two provisions that Republicans are considering jamming through the Senate over the opposition of Democrats, using a tool available as part of the budget-writing process that would require a simple majority vote. At the heart of the legislation is a trade-off in which a bank would be able to escape a number of regulations if it agreed to comply with higher capital requirements. So the GOP vision of financial security is to force banks to have a high reserve requirement? That's the purview of the Federal Reserve. That's monetary policy. The government has no business ordering higher reserve ratios. I can point to more than a few members of the GOP that used to call regulations like that "government overreach." The Financial Choice Act, approved in the House by a 233 to 186 margin, now heads to the Senate. Every House Democrat voted against it, and they were joined by just one Republican defector, Rep. Walter Jones (R-NC). Maybe Walter Jones remembered what it was like to be a Democrat again? "The Wrong Choice Act is a deeply misguided measure that would bring harm to consumers, investors and our whole economy," said Rep. Maxine Waters (D-CA), the highest ranking Democrat on the financial services committee, in a statement. "The bill is rotten to the core and incredibly divisive." Because the Choice Act has unified Democrats in opposition, it has very little chance of crossing the 60-vote threshold it would need to pass the Senate without a filibuster. But some of its key measures — including defunding several key banking regulatory agencies — could be advanced through budget reconciliation, and would thus only require 51 votes. And of course the biggest gem for Republicans is that all this hacking and slashing will save the government $14.5 billion over the next decade. That's $1.45B on average per year that we spend to make sure we never have to hand out bailouts again. Do you remember how big those bailouts were? Just taking the first company from an alphabetical list of bailouts, we get AIG and its $85 billion bailout in 2008. Ten years, $14.5 billion. One day, $85 billion. As the cadaverous husk formerly known as John McCain would say, "Rest well my friends."